Great review! Check it out. Everyone loves a good hot doctor story. Throw in some action and make him a hero and he is totally drool worthy. This is definitely something you get withDoctors Beyond Borders by Georgie Tyler. 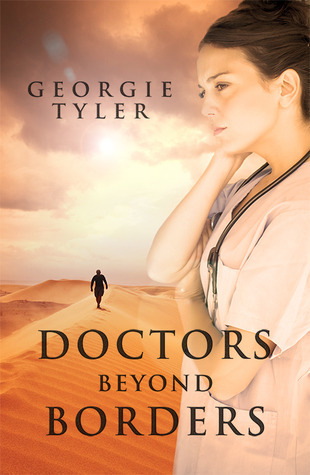 This story brings the civil wars of Sudan to the forefront and mixes in some romance between two doctors who have come to help the displaced people. For my full review keep reading after the book blurb. She’s about to find out that nothing is fair when it comes to war, except, the healing power of love. Dr. Ariadne Tate is running from her life back in Australia. The betrayal she faced has urged her to travel to Sudan with a medical organization. Romance is not on her menu. She doesn’t believe romance belongs in the workplace let alone in her life right now. Unfortunately, when Dr. Ford Gosden steps into her life things get flipped upside down. Ariadne tries to fight her feelings for Ford, but when they are alone in the desert for weeks things come to a boiling point and their feelings can’t be hidden anymore. But, when Ariadne finds out that Ford is leaving sooner than she thought she tries to escape her feelings by taking her mid post break in Greece. Ford surprises Ariadne in Greece and they finally physically share their feelings in heated nights of passion. But, all good things must come to an end and Ford my return home and Ariadne to the Sudan to finish her post. Before Ford leaves her though he vows to return to Sudan and then go with her back to Australia. The love that Ariadne has denied is given to her in abundance. Floating on a cloud she returns to Sudan. But, one wrong move and Ariadne finds herself in an unthinkable situation that threatens her love and her life. Georgie Tyler did a great job bringing the civil wars of Sudan to the forefront of this story. She also does a great job with the romance. I enjoyed that the doctors didn’t just fall into each other beds. There was some realism to the love story along with the feel of the actual threat of being in a third world country under the threat of militants. It wasn’t just the setting that made this story but the characters. Ariadne was wonderful and so was Ford, but I have to say I really enjoyed the dynamic of the other doctors in the house was fantastic. The story really became well-rounded with those wonderful characters. Overall, this was a great story. If you like a romance with a little bit of danger and one really hot McDreamy then this is definitely a book you should pick up.